Manuel Furcal got the save in this July 1990 game the hard way - he had to get nine outs to do it. Furcal came on in the bottom of the seventh inning, his San Bernardino Spirit just taking a 4-2 lead over rival Stockton, according to The Lodi News-Sentinel. The sometimes starter Furcal then held on for one of the two saves he recorded on the year, according to The News-Sentinel. Furcal got that long save in his second professional season. He went on to play in just two more. He never saw AA. 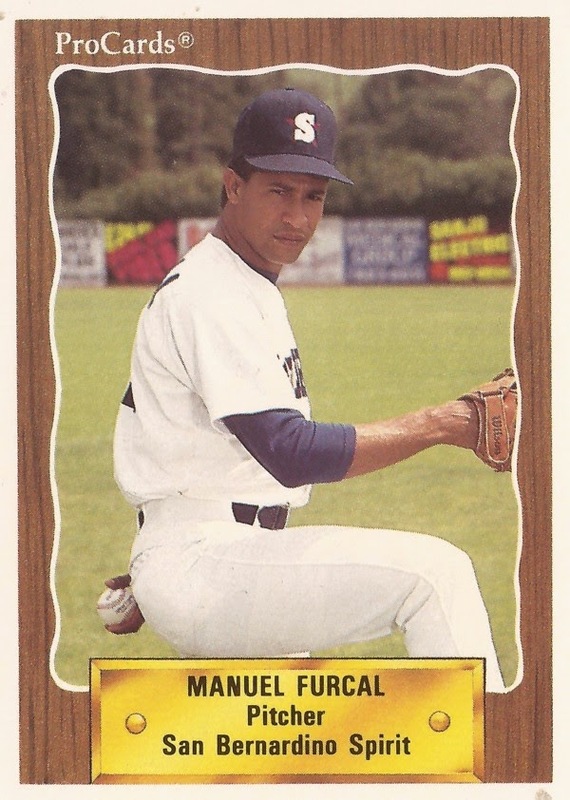 Furcal's career began in 1989, signed by the Mariners as a free agent out of his native Dominican Republic. Furcal was also sometimes referred to as Manny Furcal. 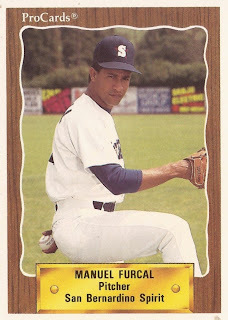 Furcal played his first season between single-A Wausau and the rookie Arizona League. He picked up five wins in 18 relief appearances in Arizona. He also picked up five saves. Overall, he had a 2.52 ERA on the year. Furcal moved to high-A San Bernardino for 1990. In 35 outings, 14 starts, Furcal had a 4.65 ERA and went 7-8. He stayed at high-A in 1991, moving with the club to Peninsula. He split time again between starting and relieving and went 4-8. He had a complete-game, three-hit shutout that June. He worked into the seventh in a July start, giving up four runs. Furcal returned to Peninsula in 1992, but he only got into six games in relief. It was his final season as a pro.